Ceresana scrutinized the European market for pipes from top to bottom: No matter if for the tap and gas supply at home or for supplying large industrial plants with energy and feedstocks: pipes play an important part and can be comparatively safe and environmentally friendly ways of transport. For the various applications materials used for the production of pipes have to offer the required properties, besides, there has to be the option of producing them at as low a price as possible. The market research institute Ceresana expects total European demand for pipes to increase to approx. 51 million tonnes in 2021. In order to reduce dependence on transit countries such as Belarus and the Ukraine, the intercontinental gas pipeline "South Stream" is intended to run from Russia through the Black Sea to Austria. In Russia, construction of this pipeline longer than 1,000 kilometers has already begun; further continuation towards Western Europe is, however, still contested in Bulgaria. The "North Stream" pipeline from Russia to Germany through the Baltic Sea, skirting Poland, was in inaugurated in 2011 already. Starting from this pipeline, secondary pipelines are built towards important consumer locations, for example chemical industry parks. Various European countries plan to build a "Trans Adriatic Pipeline" form Turkey to Italy as an alternative to the aborted "Nabucco" pipeline from Turkey to Austria. Looked at from whatever angle, the oil and gas industry will be the largest growth market for pipes. More than half of all pipes consumed in Europe are made from steel. Heavy steel pipes are mainly used in the oil and gas segment, but are also found in the industrial sector, for example plant and machine construction. In the future, however, plastic pipes, being much lighter and cheaper in production, will gain the largest amount of market shares. Various plastics help to realize desired properties. In regard to distance covered, plastic pipes already account for a significant share of the market for pipes. Compared to concrete pipes, which are usually substituted for other materials, plastic pipes can be replaced much quicker when damaged or worn out. Plastic pipes can also be customized to specialty applications. 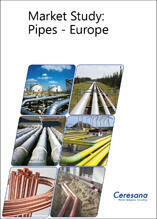 Demand for pipes in Eastern European countries is likely to increase by about 2% p.a. in the next eight years. The recovering construction sector in particular is providing growth impulses. Investment is also made in supply networks, thanks to EU subsidies, especially for potable and waste water. Consumption of pipes in Western Europe, on the other hand, is almost stagnating. Despite the potable and waste water networks being in need of refurbishment in many countries, investments in this sector have often been postponed due to the debt and financial crisis, or were cancelled completely. In Mediterranean countries in particular the situation is aggravated by a weak economic situation, so that the private sector can provide only limited impulses. The markets in Northern Europe are largely saturated. The largest growth market in Europe is Russia. This country is the largest sales market on the continent already. With the construction of new pipelines the country will continue to generate high demand in upcoming years. As a result of raw material sales, Russia is also able to invest larger sums than other European countries in the supply networks in order to connect remote areas to the potable and waste water supplies as well. The majority of pipes produced in Europe are made of steel. Largest manufacturer of steel pipes is Russia, manufacturing more than 10 million tonnes of this product. Further important manufacturers are Turkey, Germany, and Italy. Regarding output of plastic and metal pipes, Germany is the largest producer. Second largest manufacturer of plastic pipes is Turkey, of metal pipes Italy. Chapter 2 offers a substantiated analysis of the application areas for pipes: Data on demand development in the applications sewage, potable water, construction, oil & gas, industry, and other applications, split by 30 countries, is given. Chapter 3 offers information on consumption of individual materials used in the pipe production (steel, concrete, plastics, and metal), split by 30 European countries. Chapter 4 provides profiles of the largest manufacturers of pipes, clearly arranged according to contact details, turnover, profit, product range, production sites, and profile summary. Extensive profiles of 79 manufacturers are given, including Georg Fischer, Ilva, Marcegaglia, Salzgitter AG, Tata Steel Europe, Tenaris, Tessenderlo, Thyssenkrupp, TMK, Vallourec, and Voestalpine.